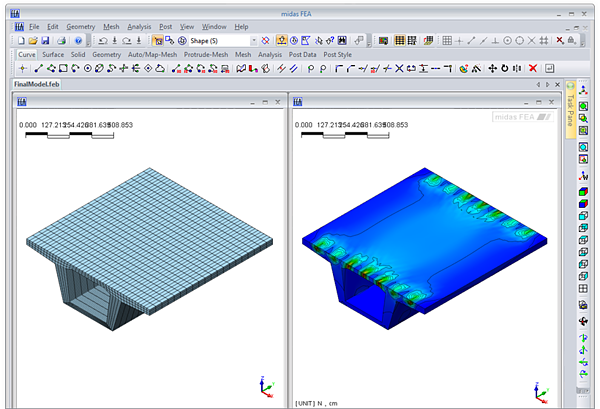 Steel design has multiple key applications that require the use of solid and plate elements to perform analyses that are acceptable for design codes. Steel connections in particular require local analysis of elements to calculate deformations and failure conditions. 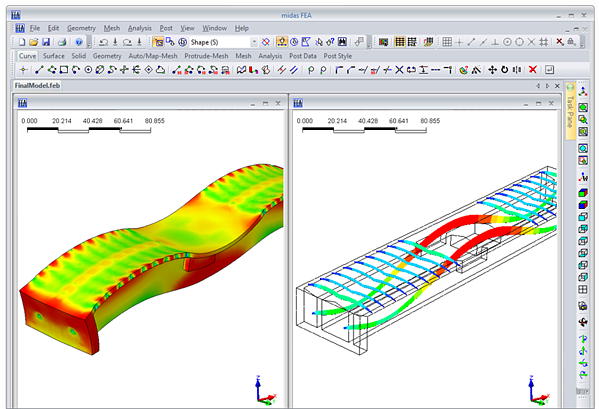 With midas FEA you can use plate elements to simulate both friction and bearing connections. The use of plate elements enables you to analyze the behavior of the steel bolts and plates as they are subjected to varying levels of tension. The results generated are substantially more accurate than those generated by idealizations and models that only use 1D elements. Thus you will be able to create designs that are both meet design codes and are optimized and economical. Certain steel design projects also require analysis of steel beam for buckling and torsional failure criteria. and effort required by other programs. 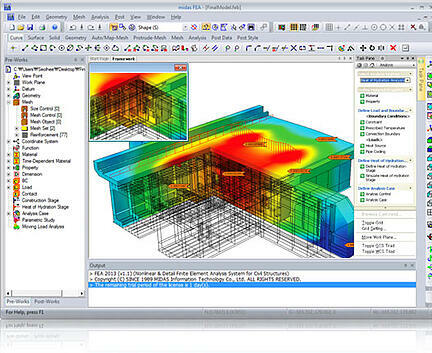 midas FEA is equipped to handle cracking analysis for concrete structures. Through the use of 3D solid elements, you can generate models that will simulate critical conditions for large concrete structures subjected to rigorous loading. The program's solver accounts for nonlinear behavior of the concrete over a 3D area with multiple loading patterns and thus calculates detailed crack patterns for each case specified. midas FEA simulates partial, full open, closed, discrete, smeared, and burgeoning crack types. It is also equipped with reinforcement analysis functions that enable it to account for the impact of rebar in the tensile behavior of concrete structures. These highly specialized capabilities will enable you to handle a wider range of concrete analysis and will eliminate the need to rely on overly conservative models. The cables of suspension and cable-stayed bridges are connected to the bridge deck by cable anchors of steel and reinforced concrete. These connections must be analyzed in detail with solid elements in order to properly calculate critical conditions and safety factors. 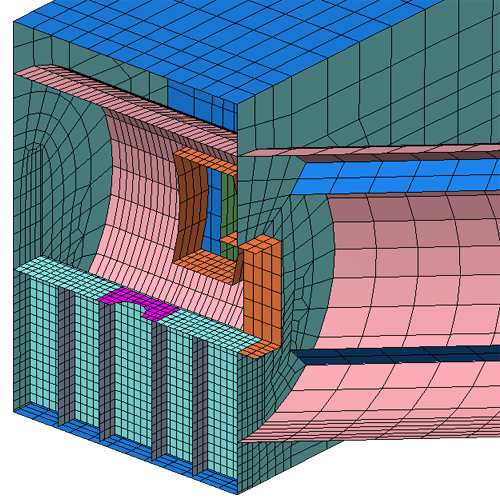 The complex geometry of these connections make them especially difficult to model accurately with conventional finite element analysis programs. 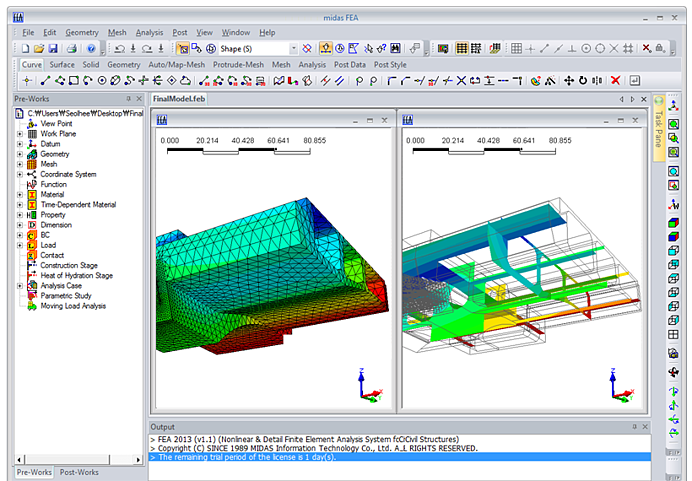 midas FEA's advanced modeling functionality enables you to easily create solid elements that precisely simulate the actual project elements in shape and behavior. and stresses that contribute to failure. Thus you will be able to do the design work for any type of structural connection. These bridge wizards also contribute to higher quality results. and the results will be more accurate and reliable as well.